It’s a wonderful car that just happens to be electric. I've driven the Chevy Bolt a few times. At CES, briefly in San Francisco, and after a tour of the GM plant where the electric car will be assembled. But all those tests were in preproduction vehicles. Sure, they were working cars, but they weren't quite ready for consumers. 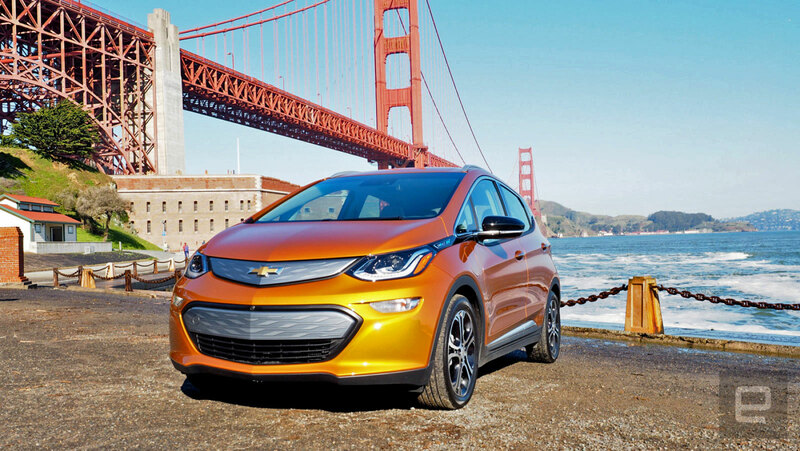 The company still needed to tweak and refine the EV leading up to its official launch at a dealership in Fremont, California, in December. Finally , GM put me behind the wheel of a consumer-ready Bolt, and I wasn't disappointed. Chevy has pulled off something rather spectacular. It's built a car that, regardless of drivetrain, is a wonderful four-door hatchback. The interior is big enough to carry four full-size adults plus a week's worth of groceries, while the vehicle itself retains the nimbleness and driving experience of a small vehicle. More important, it's a tech-savvy, long-range EV that hits just under the $30,000 mark and doesn't make drivers feel like they have to change how they drive. That's my biggest takeaway from my 100-mile-plus drive through the mountains, cities and highways of the Bay Area. Like while driving a Tesla, I never really felt any range anxiety. It's rated to go 238 miles between charges thanks to its 60-kWh battery pack. But unlike any currently available Tesla, you can buy a Bolt for less than $30,000 ($29,995, to be exact) after federal tax credits. Sure, the $35,000 (before federal tax credits) Model 3 is on the way, but the Bolt is on sale right now in Oregon and California and will be available nationwide in mid-2017. Of course, only the most obsessed-with-range EV owner will be able to eke that 238-mile range out of the vehicle. From my drive in various conditions and using all three modes (sport, drive and low) I logged about 216 miles on a full charge. If the car had had more high-speed highway time, my mileage would have been less. But I spent less time checking how much juice I had and more time just driving. To top off that long-range battery, the base model Bolt ships with industry-standard level 2 port. 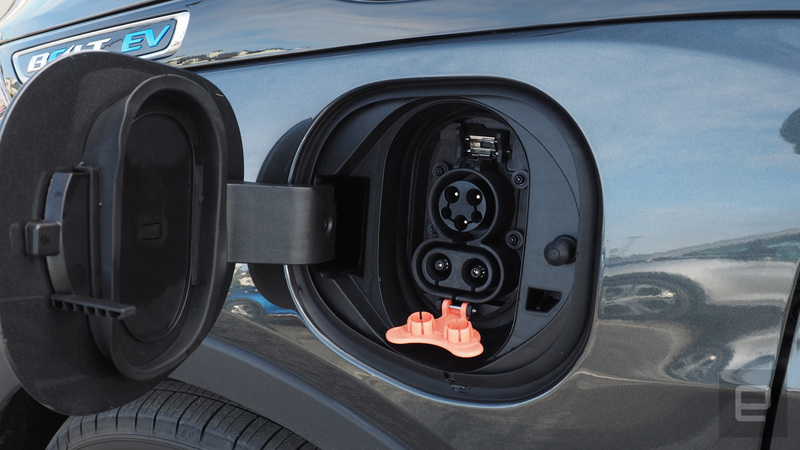 The 240-volt plug will add about 24 miles in an hour to the car. A typical 120-volt home outlet will add roughly 4 miles in an hour. For an additional $750 buyers can add the optional DC fast charger that will push 90 miles in 30 minutes to the pack. Of course, it requires a DC fast charger. But more of those are appearing every day. Buyers will have to weigh the pros and cons of each system, but the level 2 standard charger should be more than enough for most commutes and weekend jaunts. However you charge, the car itself doesn't feel like it's been watered down or restricted to get you to your destination. It pumps out 200 horsepower and 266 pounds of torque from its 150-kW motor. It has enough getup-and-go in sport mode to tame local onramps with a zero-to-60 rating of under 6.5 seconds. Even in regular drive mode the car felt quick thanks to all that electric torque, which also helped it launch on the steep hills of San Francisco without any issues. In low mode the car dials it back a bit and enables some aggressive regenerative braking when you take your foot off the accelerator. 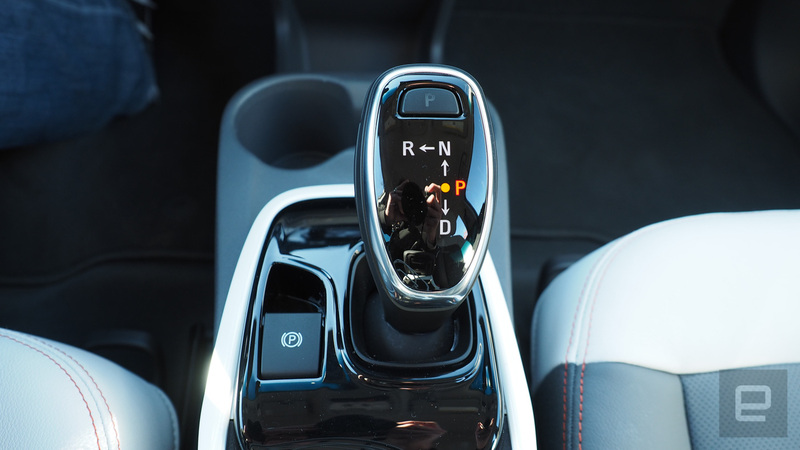 Chevy calls it one-pedal driving. It made perfect sense while driving in traffic and on San Francisco's surface streets. For even-more-energy-conscious folks, the Bolt borrows a feature from the its hybrid cousin, the Volt (a pair of cars that will force folks to enter into a "Who's on First" routine each time one of them is mentioned): the Regen on Demand lever behind steering wheel that brings the car to a stop without using the brake while maximizing the amount of electricity being sent back to the batteries. 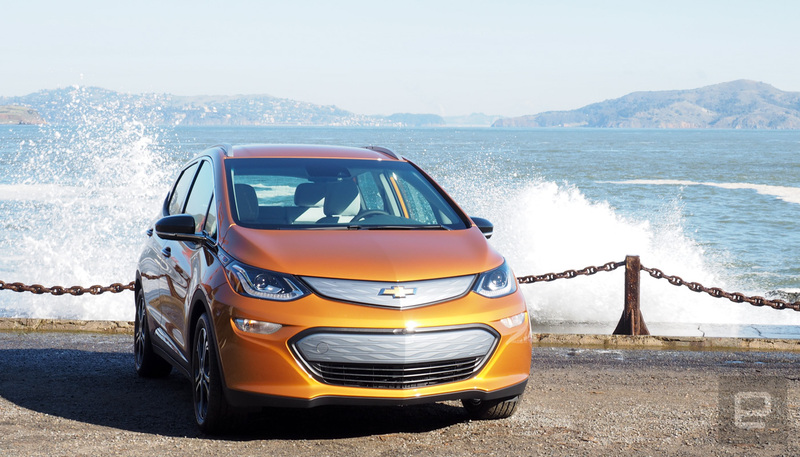 During the drive, it was clear Chevy had taken the best bits of EV technology and crammed it into the Bolt. That includes a low center of gravity thanks to a battery pack placed at the bottom of the vehicle. Throw in what feels like a slightly tighter suspension than what I found on the preproduction models, and navigating mountain roads was a blast for what's essentially an economy car. The steering is tight and the ride is solid enough for spirited cornering, but not so much that a rough road or pot holes will knock you silly. All that adds up to a driving experience that's more entertaining than I would have expected. Chevy could easily have hit its mileage range and price points and called it a day. But it made something better: an excellent car that just happens to run on electricity instead of gas. That's not to say the Bolt is perfect. One issue that might turn off some potential buyers is the front seats. They're not uncomfortable — if you fit into them. At 6'3'' and 210 or so pounds, I felt as if I was hitting the width limit of chair. Any driver that's wider than I am in the hip area would probably start feeling cramped after about 30 minutes. The rest of the interior feels open and roomy thanks in part to all the large windows. I was able to sit in the back seat without the front passenger sitting with their knees pressed against his chest. 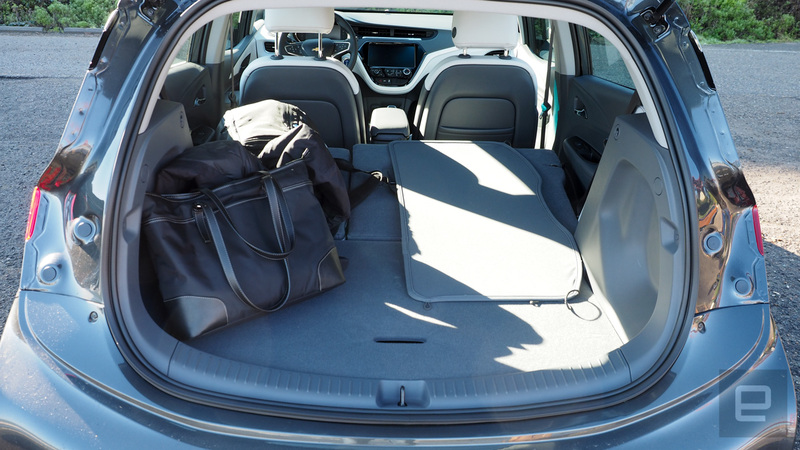 You can put most of your junk in the trunk, and because the car doesn't have a spare tire (it has special Michelin tires that automatically seal themselves) there's extra room below the main cargo area. Putting the rear seats down obviously adds enough room for most trips to Ikea or Costco. Chevy wants the driver not only to feel like she's not cramped, but also that she can customize her infotainment experience. Information on the 10.2-inch touchscreen can be adjusted to the whims of the driver. Changing the widgets (which include energy use, audio, phone, clock, Bluetooth setup and others) to fit your needs is straightforward. The dash cluster is also adjustable with three different layouts: classic, modern and enhanced. Classic gives you the bare minimum of information. Enhanced goes full-bore on details about your driving and modern is somewhere in the middle. One thing Chevy did not add is navigation. 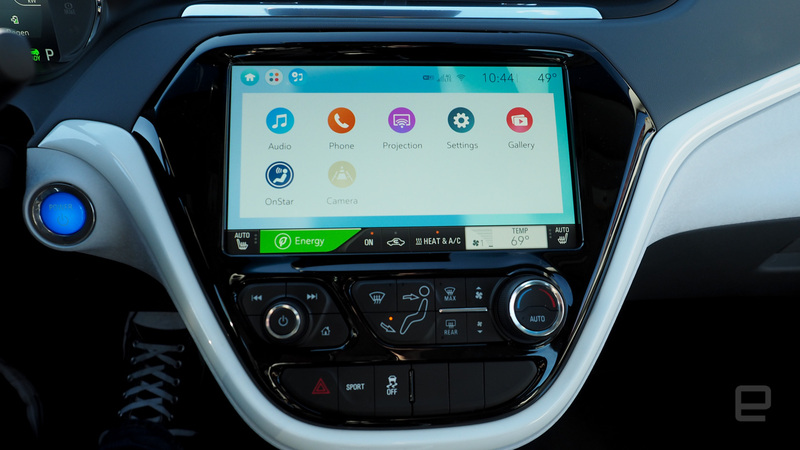 Instead, it expects Bolt customers to use Android Auto or CarPlay to fill in that gap. I rarely use a car's navigation system and rely more on my smartphone to get around, so this decision makes sense to me. One issue I did have with the infotainment system was the angle of the center console. I had to lean forward to reach the top icons. Not an ideal situation. But overall, I'm a fan. It doesn't feel cluttered or overwhelming and it presents the information you want and how you want it without having to delve into the owner's manual. Really, that's one of the biggest selling points of the Bolt. You just get in and drive. Sure, it's full of technology, but most of that gets out of the way and lets the driver enjoy himself. Chevy wanted to create an an affordable, long-range electric car without compromise but what it's done is actually a bit more ambitious: It's shown the world that Detroit is not only embracing the future; right now, it's the leader.